On Wednesdays we get up early and pull our belongings together. The routine is familiar. 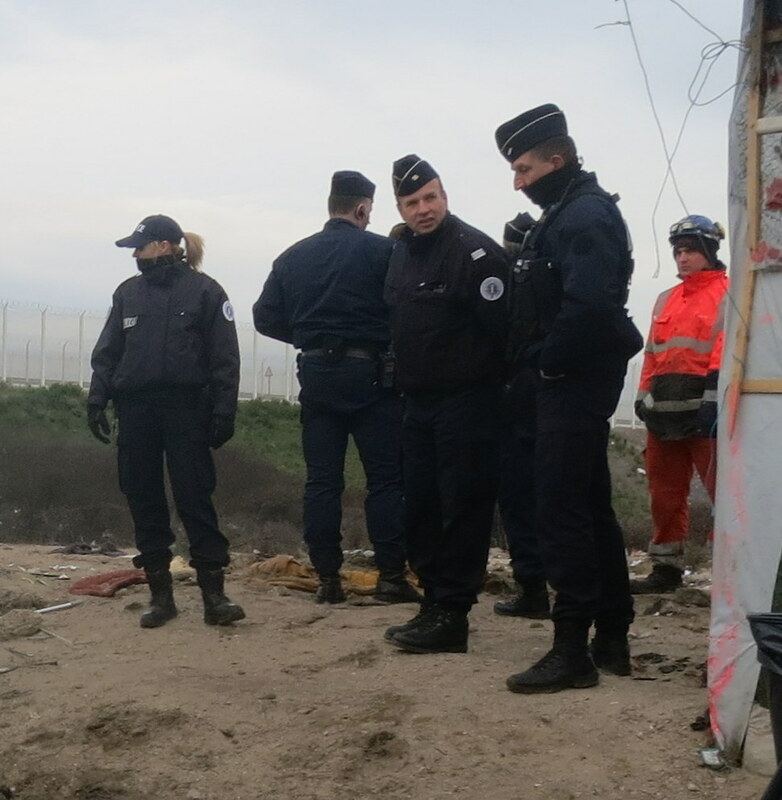 We leave Paris and drive three hours north to Calais. It’s a small French port on the English Channel. If I had to describe it, I would say rusty bars and ice cream shacks, dodgy discos and souvenir shops. Ferries ply the waters to England on a regular basis. The euro-tunnel entrance is not far away either, offering shiny travelers a quick trip under the waters. But head three miles north of the downtown, to an industrial wasteland and it is a different story. Thousands of refugees who are not on a beach vacation exist here in limbo. Their progress is rudely stopped by a chain link/razor wire wall built on French soil by the British. The fences snake around Calais, along the edges of the ferry terminal, along the highways, the entrance to the tunnel. They have spilled into this make-shift camp, 3,000-5,000 strong living in plywood shacks and tents in an industrial wasteland on the edge of town. The nickname is ‘The Jungle.’ Sanitation is rudimentary. Measles, hepatitis, scabies are all present. The specter of cholera looms. There is a large amount of police brutality and little law and order. According to a survey by the Refugee Rights Data Project, 54% of residents say they do not feel safe, tear gas is an every day occurrence. Double rows of razor wrapped, electrified fencing built on French soil by the British. Still – refugees get through every night. Naomi has meetings in the back. I sit down in the front office and tackle my own work, connecting to a database at a large hospital in Seattle, searching through different tables for patients with heart failure. A condition common to Seattle and Calais, only of different causes and different outcomes. 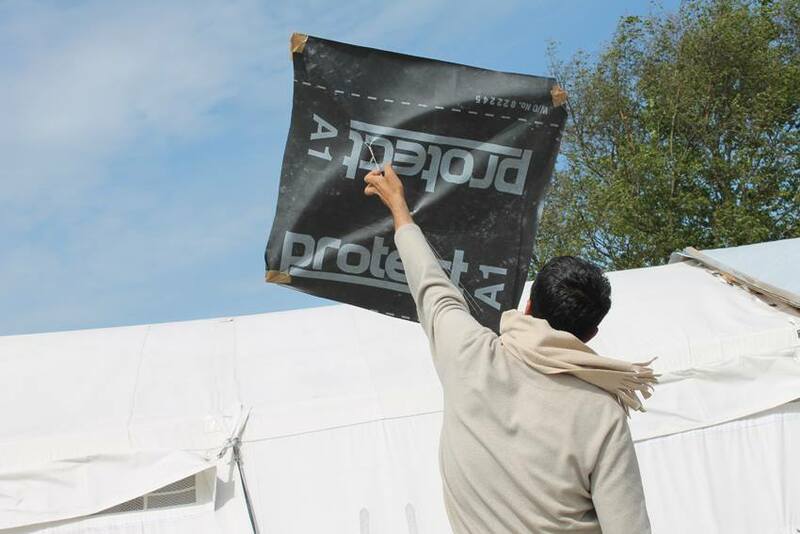 I also work on cleaning and analyzing data from the Refugee Data Rights Project. In the early afternoon, we pack up and drive a few minutes to the camp, usually getting stopped at one of the entrances by the ubiquitous French gendarmes. Different bits of body armor stick to their knees, shoulders, and elbows and guns, pepper spray, and batons hang from their belts. Their goal is to stop refugees from cutting through the fencing and getting onto a truck or a ferry. In the daytime they seem successful. At night less so. Sometimes the refugees rush the fences in mass and are beaten back by the police. Sometimes they sneak through and throw branches and rocks onto the motorway to slow the traffic, hopefully giving them enough pause to sneak onto the trucks. Many fall off and get severely injured. Others are discovered and beaten. Some die. Some pay thousands to a smuggler who arranges a container or a truck driver who will look the other way. And just enough make it to England to give hope to those remaining in camp. There are reports of trucks intentionally hitting refugees. We show our papers to the police. There was a fight recently in the camp and one group set fire to another groups tents, this was likely coordinated by gangs in the camp run by different smugglers. Up to a 1,000 people lost their homes. The police don’t necessarily want the shelters rebuilt and the back of the car is inspected to make sure we are not bringing in any construction materials. We park next to the MDM tent and then we go on a ‘maraude‘, or walk-about of the camp, handing out flyers to people as we go about the art therapy sessions. Almost everyone we see are young men, many are from Sudan, Ethiopia, Iraq and Afghanistan. I don’t take pictures of people – it is frowned upon for good reason but you see many visitors to the camp doing it. There is a lot of tension. When we pass by many of the men I can feel their anger and frustration. We do our best to smile and say hello and more than often we get a big smile in return. Sometimes we are invited inside for tea or a bite to eat. Many of the homes are extremely tidy. We tell them where to find the sessions tomorrow, that they can come and do drawing, painting, modelling and use the materials to make whatever creative work they need. We tell them if they are having a hard time sleeping or having ‘difficult thoughts’ that it is a good place to come, relax, talk, share and feel welcome. Many have fled bombings and various forms of brutality in their home countries followed by perilous water crossings and overland travels. Families have been separated, borders crept across, smugglers paid, and meager belongings lost. The camp is not a place of comfort either. People live in plywood boxes or flimsy tents. Pools of water filled with trash dot the landscape. Here and there are a few drinking water stations and rows of portable bathrooms. 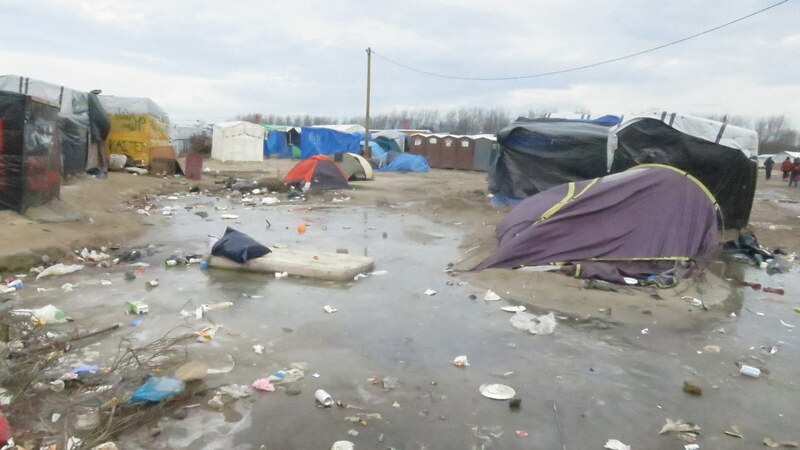 They bulldozed a huge section of the camp in the early spring, giving people one hour notice to pack up their belongings. The purpose was not just to terrorize, but to create a larger buffer zone between the camp and the nearby highway. It is a source of despair that even after their long struggles and loss to reach the shores of this rich western country, their living conditions are so dismal and the respect afforded them by the ‘system’ virtually nonexistent. The art sessions allow people an outlet to express their trauma, discord, and hope without needing to find words. Our walk finished we drive into town, stopping at a small hotel to drop off our luggage and unwind for a little, lucky to have these clean sheets, blankets, a roof that does not leak, bank accounts and passports. After a bit, we rally and jump back into the car and drive along the coast to wherever we stopped running the previous Wednesday. Each week we run south along the coast before doubling back to the car. It is beautiful and releasing. The scenery is surreal, rolling bluffs punctuated by bunkers built by the Nazis. One wonders what is repeating. On Thursdays Naomi heads to the camp and meets up with other therapists. Stories and tears are channeled through making. For many who have suffered trauma, words fail. I sit three miles away in the hotel, a coffee shop, or the library and resume my work ‘back home’. 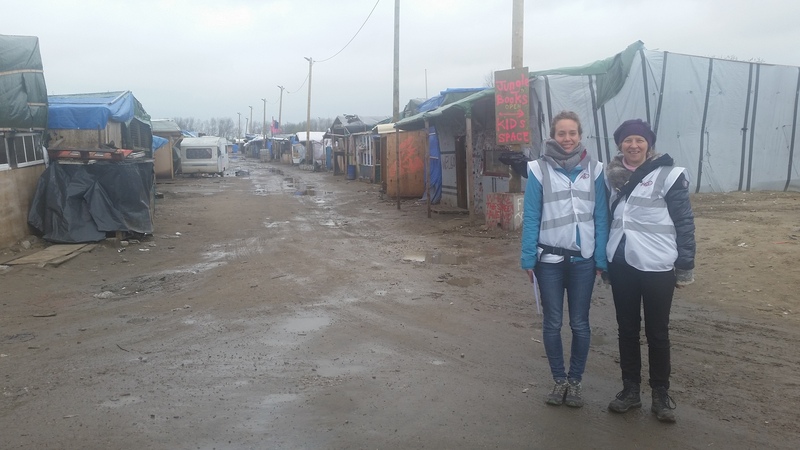 I’ve started volunteering with the Refugee Rights Data Project, serving on the advisory group and helping to analyze data collected from surveys of camp residents in Calais, and down the road in Dunkirk. Working through the data provides a filtered window into life in the camp – cells enumerated with pain, despair, trauma, violence, but also hope and resilience. I leave the hotel Friday afternoon and run the three miles to the camp.People look at me strangely – it isn’t the normal place to run. We will leave from there and drive straight back to Paris or wherever we are calling home for the remainder of the week. I find Naomi and say hello to different people inside the small plywood shack or large flapping tent that is used for this Fridays’ session. Some are making kites, We go outside and fly kites for a while on a field that once had thousands of tents. The police bulldozed this area in February and bits and pieces of people’s lives peak out of random clumps of dirt. A sauce pan here, a shoe there. Our kites soar into the sky. Some are made during the art sessions, some are store bought. They fly higher and higher, sometimes breaking the string and flying away, sometimes crashing to earth, much like the dreams of those who lived here. Now it is time for us to walk. We will traverse Pyrenees from the Atlantic to the Mediterranean. A good time for clearing heads and rejuvenating the spirit. The goal is to finish in about 45 days – following the Haute Randonnée Pyrénéenne which meanders between Spain and France while hugging the highest ridges and peaks [wikipedia]. We are lucky, to be walking by choice with passports and the means to cross borders at ease. Many are not so lucky and so we will raise funds for Art Refuge UK during our walk while recognizing our good fortune along with the similarities and disparities we face. I’ve met many of the field workers of this charity as well as some of the board members. And I’ve helped from time to time in the camp – I know they are doing great work – but they could use some help. Please note that our walk is entirely funded through our savings – all donations will go directly to Art Refuge which operates with very little overhead – so that means most of your donations will go directly to helping those in need. We will start out walk on July 12th and will be joined by my good friend Dan Price who I met as a teenager on the Appalachian Trail. If you would like to follow along, we will have regular updates posted on a map, you can also send us a message through the map. Safe trails. Shakedown Trek in the UK with Dan Price – late July.